Free Shipping Included! 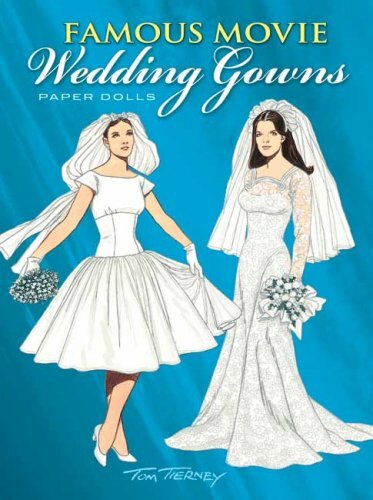 Famous Movie Wedding Gowns Paper Dolls by Dover Publications at Book Sellers Union. Hurry! Limited time offer. Offer valid only while supplies last. Tom Tierney has done it again with this exquisitely rendered collection of favorite wedding dresses straight from the scenes of cinematic history! Tom Tierney has done it again with this exquisitely rendered collection of favorite wedding dresses straight from the scenes of cinematic history! The lovely faces of fifteen unforgettable brides are accompanied by the fabulous gowns they wore for their famous motion picture nuptials. Paper doll fans and movie buffs can dress two figures in bridal costumes worn by Claudette Colbert (It Happened One Night), Elsa Lanchester (The Bride of Frankenstein), Julia Roberts (Runaway Bride), Meg Ryan (Prelude to a Kiss), and eleven more brides, all from movie masterpieces ranging from the 1930s to the present.